I’m excited to go to That Brown Show again this year; it’ll be my fourth time, I think. 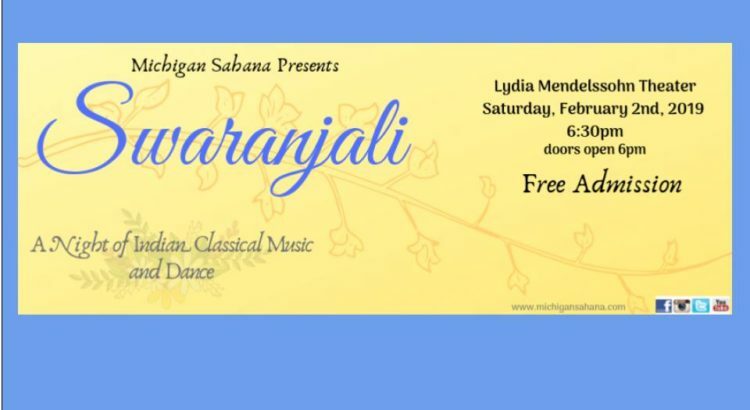 Every year the Indian student performance groups come up with something totally new, which means you never quite know what you’ll see. But they are always consistent in the high quality of work they present, and their dedication to their art. And every year what the show does best is highlight India’s bright colors, vibrancy, and our deep love for our culture. That Brown Show will be held in Hill Auditorium on March 30, 2019. The performance runs from 7-9pm; doors open at 6. Tickets can be found here. Zelda, an award-winning evolutionary biologist for her work on the ‘grandmother hypothesis’ (which suggests that grandmothers improve their grandchildren’s initial chances of survival, hence giving a reason for grandmothers’ survival past menopause), meets her daughter Rachel, a PhD student in the same field with a new hypothesis on the reason for female menstruation (as a defense against the toxicity of sperm), for the first time in The How and the Why. As they discuss their ideas, as they share with each other their past experiences, this question of worth, in a variety of ways, becomes a focal point. Is love worth it? Zelda, direct as ever, says it’s just stress. What does it feel like? she asks Rachel at one point. As a scientist in and out, this question is one I think about often. But despite the question, it becomes clear Zelda loves deeply, and, I think, understands the sentiment more fully than Rachel, who believes that when you love someone you always put them first but hasn’t quite figured out yet how to do that while maintaining one’s own self-worth. This juxtaposition of Zelda and Rachel is an interesting one, of maturity and youth, levelheadedness and emotional volatility, professionally experienced and just beginning a career. 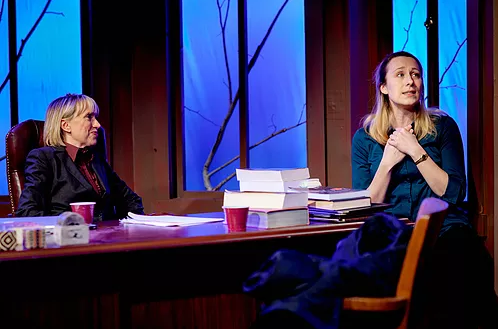 I think that the overall result of this is that everyone can relate to one of the two women; the downside is that because of the play’s context, Rachel was usually the one learning, not providing the answers. Zelda, as mentioned, provides answers and advice that Rachel, with the hotheadedness of youth, freely disregards. I enjoyed Zelda’s character very much, partly because it mirrored my own: scientific and logical, she encourages Rachel to pursue her hypothesis even though it ostensibly contradicts Zelda’s own. It was impressive that this play was so accurate with its scientific details – Is it worth it? comes up again as Zelda and Rachel discuss whether the benefits in their theories (cleaning out the uterus, for example) outweigh the risks (expending energy on creating a new uterine lining every month). Yet somehow the play still had so much time to delve into its characters’ personal issues. It is a rare breed of artwork that manages to give equal weight to both science and people, and Sarah Treem, the playwright, managed this extraordinarily well. I thought a lot during the play about how resilient women are. Towards the end, Zelda has just revealed some very personal details and is, naturally, somewhat shaken up as a result. However, Rachel then begins to get anxious about something, so Zelda composes herself and puts her armor back to help Rachel. I see this tendency in real life, in the women around me and in myself, to make ourselves available for those we love even when we are facing our own difficulties. Similarly, we don’t let our difficulties break us; we always find a way to bend with them and then move forward. Whether it’s a less-than-perfect presentation or that messy thing called love, Rachel and Zelda do the same, emerging as stronger scientists and more complex people as a result. Was it worth it? Some days yes; some days no. Theatre Nova’s latest show, The How and the Why, is another play with its roots in science. I’ve seen two similar ones over the last year, and I’ve been favorably impressed by both. One of those, incidentally, was the last show of Theatre Nova’s I saw, Constellations, which was beautifully done and makes me incredibly excited to see another of their shows. The How and the Why is about evolutionary biology – my favorite scientific subject to read and learn about – and has as its main characters a mother and daughter who are both renowned evolutionary biologists. Add to this the fact that the daughter proposes a new theory of female sexuality, and this play might just be everything I’m looking for in a literary work. The How and the Why runs through February 24. Tickets are $22 each (or if you have a financial limitation, pay-what-you-need tickets are available at the door). More information about Theatre Nova and the play can be found here. It’s been some time since I last attended a Western classical music concert. I was excited to see the programme, which included a Concertino for Strings, Schubert’s Symphony No. 3, and Tchaikovsky’s Symphony 6, Pathetique. The Concertino I thought was a pleasing piece but lacked a storyline to give the music direction. I wasn’t too familiar with Schubert beforehand, so I enjoyed hearing his 3rd symphony, finding it more elegant and a little less thunderous than Beethoven. Being a fan of Sleeping Beauty and Swan Lake, however, I was most excited to hear Pathetique for the first time. I am not a particularly emotional or vividly imaginative thinker, so I was surprised to find myself with incredibly clear mental images for each movement of the symphony. The first movement, for example, evoked the feeling of someone in such deep despair that they were almost angry, and even I found it incredibly moving. I knew the Israel Philharmonic would be good, but I was completely unprepared for how good. Even their tuning sounded like music. I loved watching the musicians move; in the first piece particularly, the orchestra was so in tune with each other that their instruments and bodies moved not just at the same times but at the same angles. While this is something that does occur in other professional orchestras I’ve seen perform, the synchrony was especially marked here. And, of course, they were perfectly aurally synchronized as well. I’ve been told before that when instruments are perfectly in tune with each other, you can hear the note vibrating in your ear. That comment referred to instruments playing the same note. The Israel Philharmonic, meanwhile, at one point played a set of different notes that were so perfectly dissonant it caused my ear to thrum in an oddly comforting way. I was floored. The musicians created a more nuanced interpretation of the music than I’ve ever heard. For example, Pathetique began with the double basses fading in, and ended with the double basses fading out. Normally, it’s easy to tell when instruments stop and start, since it’s almost impossible to go from the absence of sound to sound without that transition being obvious, but the Israel Philharmonic managed this almost-impossible feat with deceptive ease. And then came the encores. I was almost disappointed when Yoel Levi, the conductor, stepped back onto his podium, because how could anything be adequate to follow Tchaikovsky? And then they began to play a piece I didn’t recognize (I later learned it was Elgar’s Nimrod), and I immediately realized they’d found something that was not only adequate but perfect to follow Tchaikovsky. I look forward to listening to Nimrod again soon, but I’m afraid a recording of the piece will not do it the justice that the Israel Philharmonic did. And then Levi came out for a second encore, and I was again disappointed, but once again, that disappointment dissipated into a sort of melting sensation as they began to play the waltz from Swan Lake. Gazing at Hill Auditorium’s intricate ceiling as one of my favorite pieces of music washed through me, I wondered why I had bothered to wear makeup that night, as this music was bringing all my usually-docile emotions and stirring them up, leaving me feeling exposed in a way no makeup could adequately cover.